My husband and I participate in a local art club, Art Jam, at the Rhythmix Cultural Works. Every month or two The K Gallery (where incidentally we held our very small wedding two and a half years ago) has an new exhibit. This coming month the exhibit is called “Mini Masterpieces.” It’s an opportunity for Art Jam folks to display their small works of art for people to shop for Christmas and holiday presents. FH put in various small paintings, and I put in my upcycled sweater ornaments. It’s nerve-wracking for me to try to sell my stuff, I always get a little weird about it. I am a private person and am pushing myself to display my arts and crafts, and to blog here about my life and loves. It’s a practice for me to “be in the world,” as I spent much of my life daydreaming and worrying. Being in my body and here, now, doing whatever it is I’m doing takes breathing and remembering to rest in each moment. On the plus side, I have to say, it’s also fun and exciting to be out in this world participating and connecting. The opening of the show is Friday November 14th. The K Gallery is always open the evening of the 2nd Friday of the month, as are many other galleries in Alameda and Jingletown (the part of Oakland very close to Alameda). If you are local, stop on by! This entry was posted in blogging, crafting, mental and emotional well being, photography, thinking and tagged art, blogging, blogging 101, craft, crafting, fear, gratitude, meaning, mindfulness, nablopomo, photo 101 by Project Easier. Bookmark the permalink. 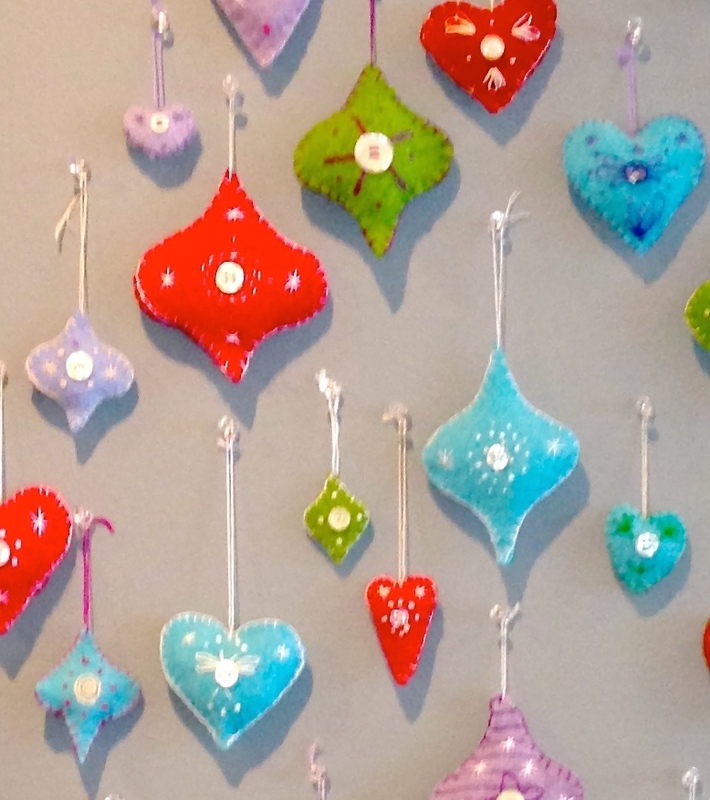 Very cute, colorful ornaments. You don’t get anywhere hiding your light. Welcome out into the world. Thanks so much! I look forward to more of your writing and artwork too. You have some really gorgeous and thoughtful photos and I’m excited to check out more of your blog! P.S. Thanks so much for following my blog!